Surrounded by a flourishing garden and by an uncontaminated nature, located in a lovely area with a stunning view, the villa offers a warm welcome to its guests and a sweet escapism from everyday life! The quietness of both countryside and sea paradises and the beauty of the natural masterpieces of this land will let you breathless! This is the right place from which starting an interesting trip around the South-West coast of Sicily, since Ribera is surrounded by gorgeous, uncontaminated and also unknown beach places. Some of them are natural reserves thanks to their beauty and their wildlife conservation, such as Foce del Fiume Platani, a protected area between Borgo Bonsignore and Capo Bianco, whose calcareous cliffs rise up marking the landscape incomparably. The villa is smartly furnished. It is made up of 2 bedrooms, a lovely wide kitchen, one bathroom, a comfortable living room with sofas and a very nice veranda which opens to a very nice garden and the swimming pool, recently built. Here you can close your eyes and forget your city stress! Fantastically well presented villa within lovely quiet surroundings. We were looking for a quiet, relaxing holiday which Villa Camimello provided brilliantly. The owner was extremely helpful when we arrived and was always on hand if we needed anything throughout the week. The swimming pool was perfect for entertaining our four children and the nearby beaches were lovely and only a short drive away. 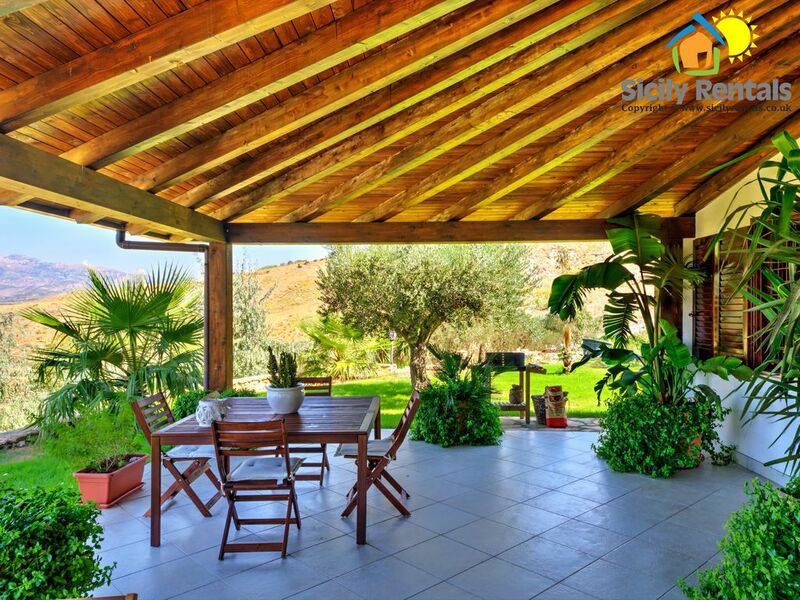 We would highly recommend this Villa for anyone wanting to get away from it all and experience a true Sicilian experience. Wonderful place to relax and explore the region. House was beautifully presented and the swimming pool was just right for our 3 children. The property has surpassed our expectations! From its location in the middle of an orange orchid to the noise of nature uninterrupted by human made sounds, it was a real corner of paradise. An extremely spacious, private and well equipped villa. We especially enjoyed the outside seating areas and pool with stunning views all around. We had a very warm welcome, and were well looked after during our stay. We enjoyed the beautiful Eraclea Minoa Beach and café, and would love to return one day. We highly recommend this villa to anyone who needs a quiet, and relaxing space away from it all! Thank you! Lovely villa with stunning surroundings. Perfect for getting away from it all. Nice villa for sitting around poolside and relaxing or walking around in the orange and olive groves nearby. Nice place to do watercolour painting or if playing the flute without disturbing anyone. There is a good selection of seating areas around so you can get the sun all day. There are a couple of nice restaurants in the town of Ribera and towards the beach. Beach is also only 5 minutes drive away and is very quiet. Über eine ziemlich halsbrecherische Straße erreicht man das Ferienhaus, das zwischen Oliven-, Orangen-, Zitronen- und Feigenbäumen liegt. Wunderschön sind die Terrassen, die in alle Himmelsrichtungen gehen und man kann sich seinen Lieblingsplatz suchen. Wir waren nur zu zweit, da war die Ausstattung im Inneren in Ordnung, wir haben auch nicht gekocht. Bei Belegung mit vier Personen wird es allerdings etwas eng mit dem Geschirr, vor allem Gläser, Tassen und kleine Schüsseln (gar nicht vorhanden). Alles war sauber und gepflegt. Zu den Restaurants muss man immer fahren, fußläufig ist von dort nichts zu erreichen. Wer aber die Einsamkeit liebt und mal niemanden sehen und hören will, der ist dort genau richtig aufgehoben. Wir haben die Woche genossen. Villa Camimello is characterized by an excellent position and a lovely landscape combined with the quietness of a rural and cosy house not far from some beach paradises. It is located in Ribera, a nice village which rises on a wide hill nearby Agrigento and famous for its international oranges production, so that it is known as “City of oranges” all over Europe. “Torre Salsa” is another natural masterpiece, located between Siculiana Marina and Eraclea Minoa. Its peculiarity are the chalk and clay cliffs and the very bright sea, whose bottom is marked by a rich blooming flora and fauna. The six kilometres of wild nature encompass jagged shores, golden and secluded beaches, sandy dunes and uncontaminated paths which will fascinate sea and nature lovers. Furthermore you can admire the old famous sighting tower that dominates the top of a little promontory in the very centre of this oasis. What you mustn’t miss is “Scala dei Turchi”, a singular white cliff made by limestone and clay which rises along the coast of Realmonte and overlooks a crystalline sea. Its name comes from the Turkish invasions. According to an old legend, the Saracens got there from the sea and climbed the cliff until the top; once there, they attacked the local people. It has became a tourist attraction for its particular colour and shape; wind and rain have modelled it throughout the time, creating a huge natural staircase whose lines are rounded and irregular. Its white rocks look brighter thanks to the sun light and the water is incredibly clear.. it’s a paradise! Villa Camimello will offer you this and a lot more. You will experience the emotion of a special vacation combing the typical rustic quietness, magic landscapes, sea and natural paradises but also marvellous cultural routes.